New Ordnance Survey Mastermap DWG data exports arriving 10th July 2017. 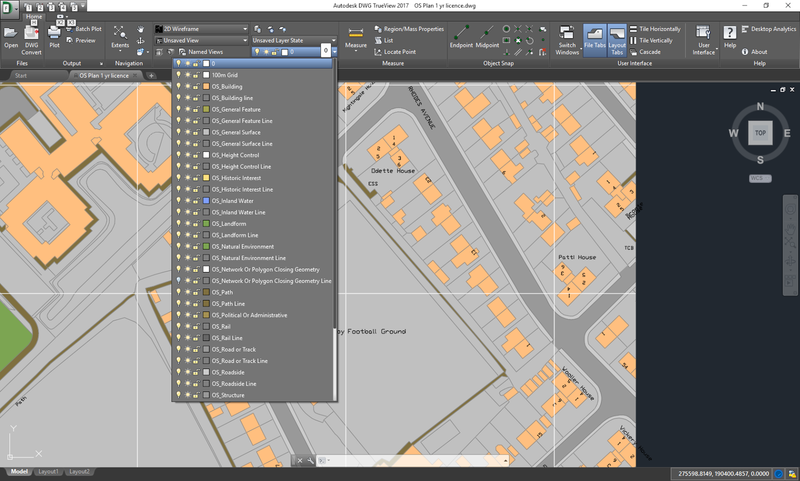 It's been in the pipeline for a while, but from 10th July 2017 we'll be launching a new OS MasterMap DWG data export service. Our new and improved DWG file is packed with more information, more layers and greatly enhanced styling. New OS Mastermap DWG file opened in DWG Trueview. Splitting data features into separate layers (where possible) to enable you to easily distinguish between lines and areas. Optimised for 2D and 3D viewing. Defaulting drawing units to metres to make measuring more straightforward. Using the building height attributes provided by OS we can also convert files into 3D models more easily (see previous post). To check out this new data structure just download a sample.. If you have any questions please get in touch. Our support team is always happy to help.